FAQ’s specifically about school policies and procedures can be found at the General Wolfe VSB Site. Each class has a parent classroom representative who communicates with parents of each class for class specific events, activities, socializing or parent involvement. Please contact your teacher if you don’t have your parent rep contact information. Why are there so many split classrooms? Each year teachers meet to look at student needs and class composition. As a staff we draft several school organizations and examine each for its advantages and benefits. As a staff we make a decision on the organization that meets the needs of the most students. We are staffed to have classes with a maximum of 30 intermediate students, 24 primary students and 22 kindergarten students. As a school we also strive to meet the district averages of 28 intermediate students, 21 primary students and 19 kindergarten students. To keep updated with news and opportunities, please attend the PAC meetings, join the PAC google groups list or visit this website. You can also email any PAC executive member if you wish to get involved and we can help direct you to specific areas of interest to you. What do we fundraise for? General Wolfe PAC raises money for items NOT paid for by the School District or Province such as: sports equipment, library books, field trips, arts programs, computers, software, sports uniforms…etc. A few examples of what the PAC supports is musical instrument upkeep, replacement for aging technology (ie. laptops), social and emotional learning, science equipment, literacy materials, skating and performances, Vancouver symphony field trip, earthquake kits, graduation ceremonies, sporting events, bursaries, classroom petty cash funding, after school clubs, field trips and more. A full list is available on our Treasurers Report. Click here to see the fundraising events that support these expenses. Are there any PAC-sponsored social activities? While we have fundraising activities, we also have social activities to help bring parents together. At the beginning of the year there is a Welcome Back party to re-connect with each other after the summer break and to meet new parents. In October there is the annual Halloween dance which is a tradition at Wolfe! The dance has music, drinks, snacks, glow sticks, 50/50 draw, and more! There is a small admission fee to cover expenses. It’s a great way to meet and socialize with other Wolfe families. There is a volunteer appreciation event after school in the Spring to thank all those who have volunteered their time; this event is combined with the staff appreciation event. And there is a strong social aspect at all our fundraising events as well. Can you please explain Wolfe’s Fraser Institute Rankings? Susan Nichols, our principal, gave an explanation in a previous PAC meeting. Click here for that information. As part of our goal of parent involvement, we are encouraging parent education. Over the year there will be some parent education topics such as parenting in the age of digital media. We would like more ideas from you, as parents, to bring more ideas that you would find valuable for parent education. Some of our previous talks include: developing healthy friendships…etc. The PAC believes in supporting our public schools. 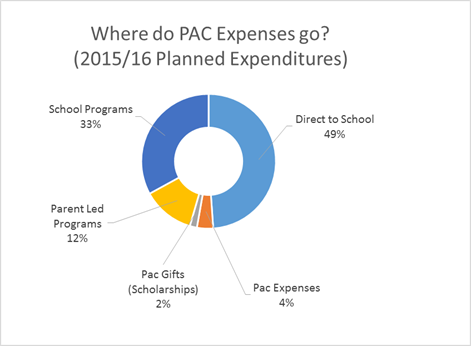 There are concerns about the erosion of funding and the increased reliance on the PAC to raise funds. Our PAC chair has written letters to Minister Fassbender and Minister Bernier. Here is the Minister’s response. There is also a group called the parent advocacy network (http://www.panvancouver.ca/). The Parent Advocacy Network for Public Education is a grassroots collective of parents from over 37 schools (and growing) across Vancouver who share a commitment to public education. Our mission is to connect parents and PACs across the district to support one another in advocacy. The network enables us to share information, experiences and stand together in protecting public education. Is there a School Nurse? The school has a Coastal Health nurse assigned to it. She runs the immunization clinics, trains staff about anaphylaxis, works with teachers when requested to share healthy living information and answers questions from the school related to health issues. She is not regularly scheduled to be I the building. Ongoing first aide for staff and students is done by Rosemary Carollo, the Office Administrative Assistant. Yes – click here for more information.